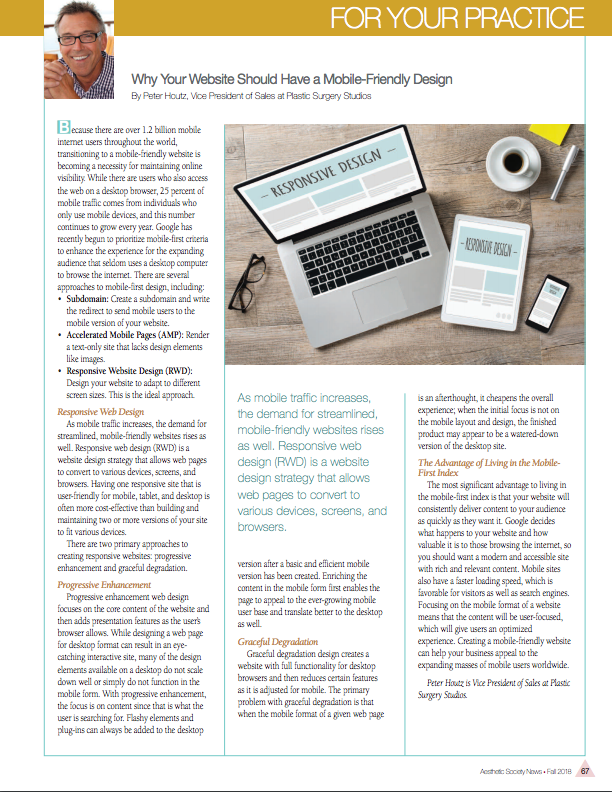 Our article in the ASAPS quarterly newsletter discusses the importance of having a mobile-friendly website. The American Society for Aesthetic Plastic Surgery (ASAPS) is a prestigious international association of board-certified plastic surgeons. We at Plastic Surgery Studios are proud to share our evolving digital marketing strategies with medical professionals around the world, not only at the annual ASAPS Meeting but also in their quarterly newsletter. Our contribution to the Fall 2018 issue of Aesthetic Society News (on page 67) discusses the value of mobile-friendly responsive web design and the benefit of living in Google’s mobile-first index. Mobile online traffic is blossoming more and more every year, making it absolutely necessary for businesses to adopt a responsive web design (RWD) strategy. With RWD, a desktop website can adapt to multiple web formats and screen sizes while maintaining its functionality. Progressive Enhancement: This approach involves starting the design of a website with the mobile version and expanding to desktop from there. While elaborate design elements and fancy plug-ins enhance the desktop version of a site, many of these visual characteristics do not translate to a mobile format. Putting the mobile version first when designing a website ensures that the focus is on what matters most for mobile users: content. Graceful Degradation: This approach involves creating a desktop design and reducing it to a mobile format. Building a website with the desktop version in mind can be problematic because less effort is placed on what works best for the mobile format. There are broader possibilities with desktop web page design. However, if most of the traffic comes from mobile users, that’s where design should begin. The most significant benefit of being a part of the new mobile-first index is giving your audience the best possible user experience. When you consider the increased site speed, valuable content, and user-focused construction of a mobile-friendly site, the advantages are endless. The easier it is for potential customers or clients to navigate your website and understand your services, the higher the chances are for conversion.